Professional Carpet Cleaning In Miami, DISCOVER The Difference Of True Carpet Cleaning Professionals! Top Steamer, Inc. uses a 6 step carpet cleaning process to deep clean YOUR carpets unlike the one step process used by many cleaning companies. 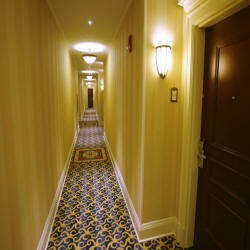 Our cleaning process is recommended by most major carpet manufactures and is approved by the Carpet and Rug Institute. 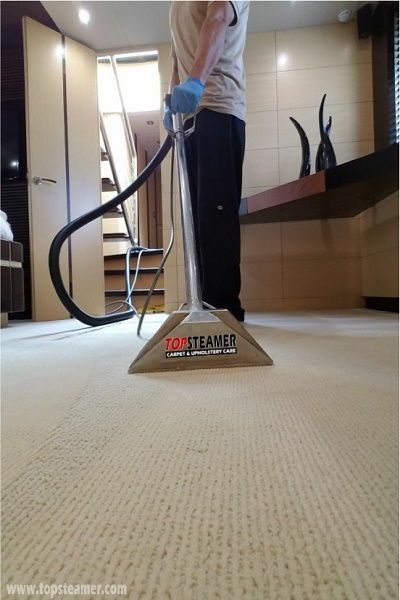 Top Steamer technician begins by spraying with a high pressure sprayer a specially formulated heated cleaning solution deep into the carpet fibers to loosen embedded dirt and stains. Then we rinse extract with a specially formulated fiber rinse to lift and removed deep down dirt and the cleaning solution residue. The result of our POWERFUL 6 step carpet cleaning process in Miami is a much cleaner, healthier, softer carpet YOU can see and feel. We will move moveable furniture and put foam blocks under the furniture to prevent rust stains and furniture stains to appear on carpet. We specialize in stain removal and pet odor removal don't forget to get YOUR carpets protected with our carpet protector. Make your appointment today call us at 305-631-5757 or send us your information by filling out our contact us form and we will be gladly to contact you to make an appointment. Top Steamer also specializes in commercial carpet cleaning in Miami from offices, hi-rises, banquet hall, large hallways, ballrooms, condos, hotels, restaurants etc. Our highly trained technicians have the knowledge and experience in providing your office with a superior cleaning of your carpet, vinyl floors or upholstery with no disruption of your business operations or to you. We can provide services to your business with evening appointments and set up a maintenance scheduled plan for your convenience. We also clean carpet and upholstery from cars, vans, SUV, RV'S and yachts. We know how difficult it is to maintain car interiors clean, just give us a call and we'll take care of it for you. We come to your house to deep clean your car carpet upholstery. We specialize in pet odor and urine stain removal from carpet. Pet stains and odor wont be removed with regular carpet cleaning it requires a special pet urine stain and odor removal treatment to the carpet, backing, padding and sub-floor to be able to permanently removed the urine stain and odor. This process requires several applications of a specialized urine stain and odor removal to the affected areas to effectively remove the odor and smell cause by urine. In other cases with severe urine contamination replacement of the padding and carpet is required as it becomes an unhealthy environment. If you have any pet stains or odor on your carpet call us now to set up your appointment or for a FREE no obligation carpet evaluation and quote 305-631-5757. Carpet Cleaning Video. Our deep cleaning removes all dirt! Get YOUR Carpet Clean With Our POWERFUL 6 Step Deep Cleaning Process, You'll Get The	CLEANEST Carpet Ever, GUARANTEED!! We also clean all types of area rugs from Persians to synthetic. 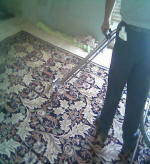 Some of the rugs can be clean in your house, some specialty rugs have to be clean at our premises. Call now to get your rugs clean and speak to one of our customer care representatives for pricing 305-631-5757 or request a free estimate by filling our contact us form. For more information about our rug cleaning service in Miami please visit the following link Rug Cleaning Miami. Top Steamer recommends to apply carpet protector to your carpet after a professional cleaning. protectors will help to keep your carpet looking clean and prevents accidents from spills of drinks, food, wine, juices to become permanent stains. One thing to remember is that most new carpet and upholstery comes treated with protector, the protector eventually will wear off with vacuuming, traffic and time. Most major carpet manufactures recommend re-applying protector to your carpet to keep it well protected, a carpet with protector makes spills take longer to absorb into carpet fibers and gives you time to clean the spills it alsomakes the cleaning process easier. Our Carpet had many weird stains and was very dirty, we were afraid it would be extremely difficult to remove. I found Top Steamer on the internet, they came over the next day and did a wonderful job! I can't believe how great it looks, we are extremely pleased with the results, thank you! This was the 4th time I've used Top Steamer and as usual they were prompt, professional, and friendly. I will continue to use them without reservation. Bravo! Easily 5 Stars every time!! Highly recommended! We've used them more than once and they are totally professional, prompt, friendly and do superb work. They have cleaned wall to wall carpeting, throw and area rugs. With this video report YOU will DISCOVER what set us apart from the competition. we don't have any HIDDEN charges or Bait & Switch tactics EVER! We are proud to be an HONEST carpet cleaning company in Miami. Call Now 305-631-5757 to get YOUR carpet REALLY clean.